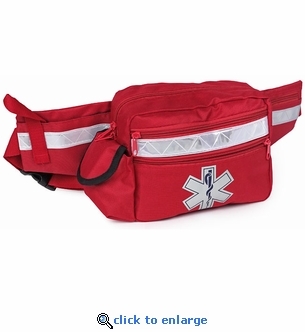 This EMT first responder fanny pack is a great hands-free way to respond quickly in an emergency. Large enough to hold your most needed supplies, this hip pack with refletive stripe is durable enough to withstand years of use. Zippered pocket in left flap. Velcro-closed covered pocket on right side. Open pocket with elastic strips inside right flap. Velcro adjustable loop on right flap. Adjustable waist strap (up to 46") with snap closure clip. Reflective stripes on front and side flaps. Made from tough 600 denier nylon. Star of Life Medical Symbol on front. Also available in Neon Orange, Royal Blue, Navy Blue and Forest Green. Special ordered colors must be bought in case quantities of 36. Please contact us at info@firesupplydepot.com for availability.